On the NPR Ed Team, I am what you might call the grizzled veteran. I've seen education trends come and go and come again. And go again. In years past, around December, my teammates would often pause by my desk and ask: "What do you think we'll be covering next year?" I've always found this a fun thought exercise, and, at some point, my editor suggested I jot down my answers and share them beyond our cubicles. And so, here are a few predictions for 2018. A quick reminder, though: I don't have a real crystal ball or a time machine. Just gut instinct, which occasionally fails me. Since 2012, the federal policy known as DACA — Deferred Action for Childhood Arrivals — has protected roughly 800,000 undocumented immigrants from deportation. Under DACA, immigrants who were brought to the U.S. as children are able to stay, work and get an education. A few months ago, the Trump administration announced it was ending the Obama-era program but left open the possibility that Congress could re-instate it by March 2018. I predict that conservative lawmakers, fearful of looking weak on immigration in an election year, will let DACA die. The reaction of DACA students, especially the 241,000 enrolled in college, will be swift and furious. And though it is unlikely they would be deported immediately or en masse, most will eventually be forced to quit school and surrender their driver's licenses and work permits. 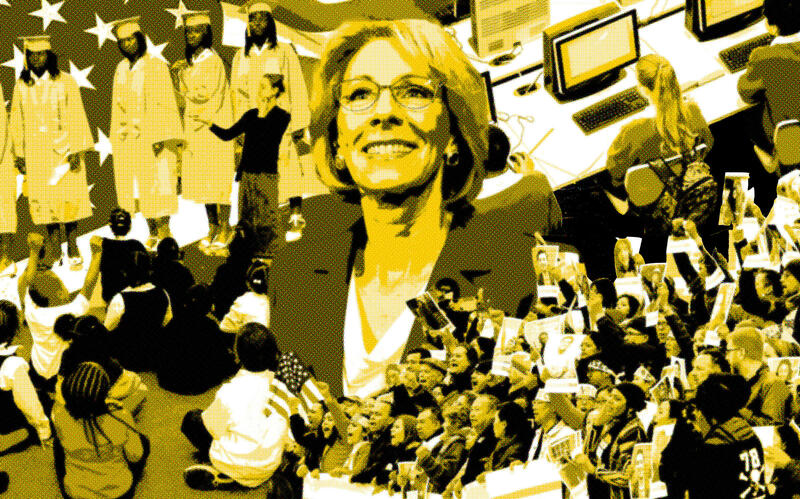 This is a leap, I know, but, since her turbulent confirmation, DeVos has had a rough time building trust with educators who question her support of public schools. In 2018, her relationship with state education officials will deteriorate and tip the scales against her. Politically, DeVos will grow increasingly irrelevant and isolated, and, by the end of 2018, she will decide to pursue her agenda as a private citizen. President Trump will be too preoccupied with mid-term elections to persuade her to stay. The nation is in a student financial aid crisis, which will only get worse in 2018, especially if Republicans' tax overhaul hits college students as hard as some predict. And, though there are no prominent court cases pending, many colleges and universities will revisit the hotly contested issue of race's role in admissions policies. Also, intense news coverage of sexual harassment and sexual assault in the workplace will spread to campuses, where both have been a problem. The focus will be on the predatory behavior of male faculty and administrators. With the federal government now scaling back its oversight of public education, vocal critics of the Education Department under President Obama will have a chance to prove that, when it comes to education, locals know best. But, under the new federal education law, the Every Student Succeeds Act (ESSA), efforts to close the achievement gap will suffer. Not only that, one trend will dominate in 2018: the continued segregation of students by race and income and its impact on learning.